Simply the act of separating water from contaminants. Water reaches its boiling point and is evaporated away leaving the non-vaporized substances behind. HF’s pollution control system’s evaporate the water in a vacuum reducing the boiling temperature to below 100 degrees F (38 °C). 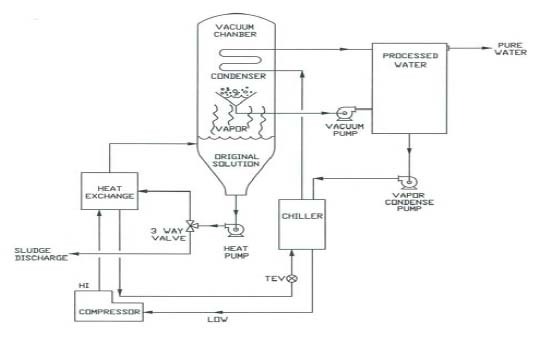 Vacuum Distillation System separates the water solvent from chemical waste solutions discharged from metal plating, photographic processing, printing ink, paint manufacturing, cosmetic, mechanical and other industries which utilize water-based chemicals. For example, in photographic processing applications, the evaporators separate as much as 95% of the water, leaving a pumpable concentrate representing only 5% of the total solution processed. After separation, the concentrate is removed from the processing facility by a hazardous waste collector who either destroys the waste or reprocesses it into other usable products. The pure water can then be discharged into municipal sewer systems or further refined for reuse. The Vacuum Distillation System allow for low energy consumption, reduced water usage and sewer costs, as well as lower waste pickup charges. The application dramatically offsets the high cost of hazardous waste chemical disposal and will assure compliance with local and federal EPA requirements. Heavy Metals, Water Based Solvents Plating. Treatment of rinsingwaters. Concentration of spent process baths. Concentration of high corrosive solutions such as chromic and hydrochloric acid.